I haven't taken any measurements but logic would lead me to believe that the m3 replica's measurements are the same as oem m3 up until the ends of the vent area. I'd assume after the vents is where the shape changes because they had to compensate for the fender. it looks like the edges would just stick out slightly like the kersher or hamaan lip/splitter. of course, i have no way of testing my fitment theory without an m3 bumper in hand to compare the replica to. Another thing i noticed while searching through lips on ebay was the fitment of the popular v-style lip on an actual OEM m3 bumper. As you can see, in the area where i'm assuming our bumpers differ, the v-style lip actually curves inward, as though it is too small for the oem m3 bumper. Back when i was considering a wide body conversion i noted that there is a 12mm difference between m3 fenders and non-m e92 fenders. This width difference on the v-style for OEM m3 sure could pass for 12mm (about half an inch), which would make it fit almost perfectly on the replica bumpers (in theory). If you notice, they also have fitment issues in the same areas that people complain about on the v-style for rep m3 bumpers, right where the vents end. Could the v-style lips just be made for oem m3 bumpers and just happen to fit? or is there a completely different mold for them as suggested by the vendors? i'm itching to try a GTS style lip on my m3 rep. I contacted JL motoring since they stock the bumper and the lip, but they said the "curve" is different and gave me a generic answer regarding fitment. I asked them to clarify if just the curve by the fender is different, or if the entire front end curve is different. Waiting on an answer. 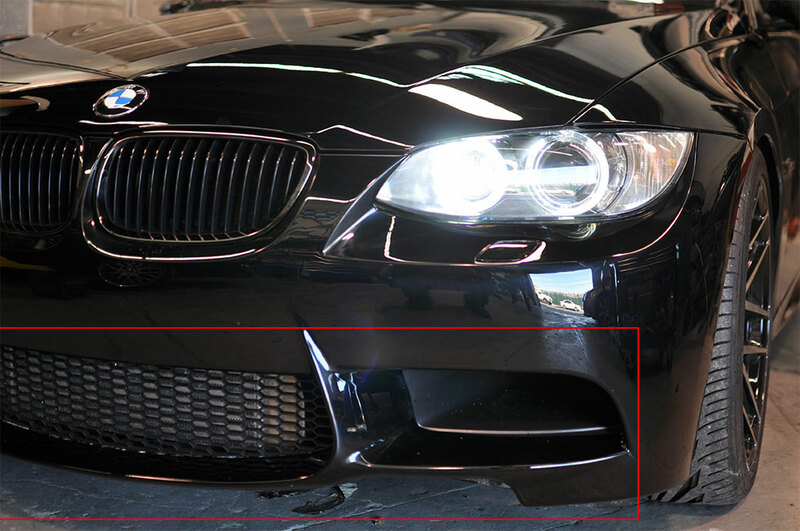 I also contacted a bunch of ebay vendors to try to find out who manufactures the v-style lip for m3 reps. I believe it might be AutoFans, but we'll see. Sounds like the best way to find out is to do the test fitment locally with that guy. But just don't purchase it . Do u have an e90 or e92? e92. i'm not sure if he'll agree to a test fitment. Just got a response from autofans. they don't produce the v-style rep, but they do make a CF haaman lip for m3 rep bumpers! I contacted some eBay sellers and here's what they said. "It is generic product and made by an Asian company we never heard of it here in the States." I asked 3 different companies and this was the exact same answer I received. Contacted **********s because they carry various lips and the m3 rep. They said gts won't fit, but they can contact the manufacturer to get a v-style lip for me... "the manufacturer says he has one style of lip that will fit it". Could be unclear communication, but to me that sounds like its a generic m3 lip that happens to fit. Anyway, I asked **********s for the manufacturer's email so I can ask further questions about the bumper fitment variations and **********s stopped replying to my emails. I just purchased a kerscher style lip off eBay that jlmotoring is happily selling for $250 + shipping. Jlmotoring even uses the same stock photos but put their own watermark over them. there were $138 ones (same thing) but those were sold out. I understand vendor support and all, but blatantly ripping customers off is mean. Yeah I purchased one of those kerscher style lips also but the seller told me they were sold out after I paid for it :-/. What is the seller u purchased it from? Please keep us posted! I will be the next customer if your experience goes well! Made a thread asking if anyone has actually tried fitting some of the M3 lips a few weeks ago. Didn't get any info. How do you plan on installing it? Looks like there's no holes for screws. if you are looking for a V-style lip for m3 rep bumper, I highly recommend modmy3.com . Excellent customer service, quality, fitment, and best prices around. Sorry, we cannot pass along that information, it's confidential, but as I already mentioned, they stated the GTS lip will not fit.